Brand New and format for the brand new Issue 45! It’s a New Year, New Me with our latest issue featuring a whole new appearance and layout inside with amazing new features, new designs, new step-by-step projects and exciting new content all in this jam-packed 100 page issue! Inside you see will regular features with a new look such as Readers’ Gallery, Sketch Challenge, Your Letters, News from Hunkydory and more. 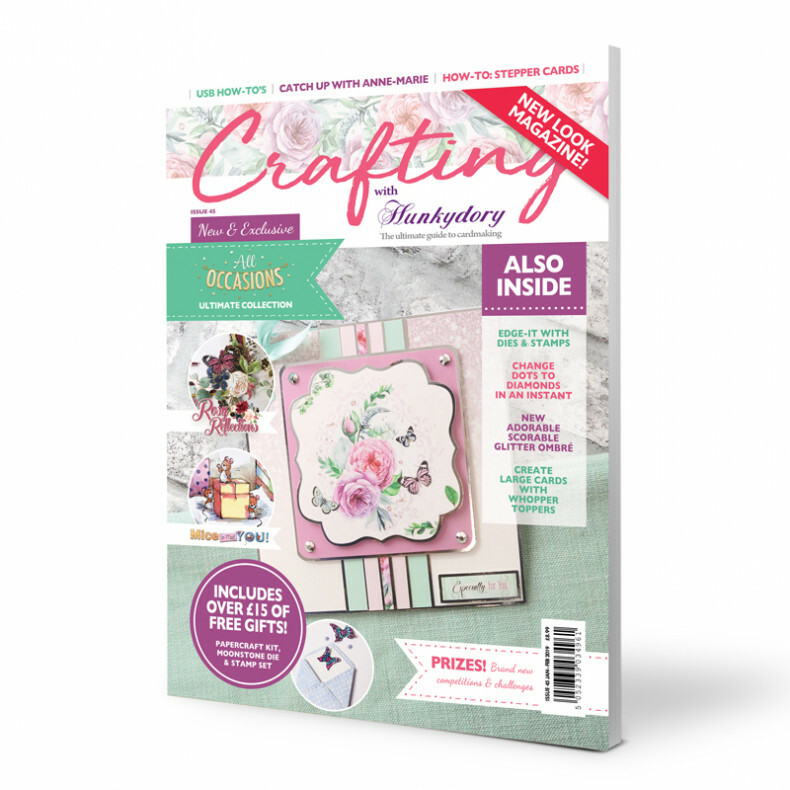 This issue even contains some fantastic features including Meet the Designer – Anne-Marie, Hunkydory is Green and introducing some of our most loved products. Crafting with Hunkydory also includes three FREE gifts worth over £15! These include a wonderful Sending You Love Deluxe Card Collection, Moonstone Die and A7 Stamp Set, all of which work together! Each Topper Sheet features a different theme with a beautiful colour scheme, ensuring you can send these to a range of your friends and family, for any occasion. The artwork includes a beautiful arrangement of gorgeous teacups, stunning bouquets with delicately wrapped gifts and a vintage typewriter surrounded by florals. There are lots of lovely sentiments to help personalise each card for a variety of occasions. With the 3 co-ordinating printed cardstock and 1 accent foiled cardstock, you can at least make 4 cards by just folding the cardstock sheets in half, but crafters can take this kit even further by cutting up the sheets to use with matting and layering! Contains 1 die to cut out 2 elements; an envelope and letter/envelope front. Combine this with the A7 stamp set to create fluttering butterflies bursting out from an envelope and more! Even better, the Sending You Love card kit is printed on Matt-Tastic cardstock so you can use your stamps to stamp directly onto your kit! There’s plenty of inspiration and projects inside the brand new magazine to get you inspired with these brand new gifts.